It’s been another hectic couple of days for The Royal Mint team as we’ve been following up our launch of the UK’s first £100 coin with the announcement of the coin designs that will appear in purses, pockets and piggy banks in 2015. Yes, having sort of established a new tradition in the New Year’s Eve unveiling of the nation’s coins that will hit circulation in the year to come with last year’s announcements, we were at it again. With the news that The Royal Mint will be issuing coins that mark some of the greatest moments in the country’s history – showing once again what an important part in the national consciousness coins play as carriers of shared social and political history – it was a clean sweep across the media. Online pieces were stunning with belters in The Times, Scotsman, Daily Express, Daily Mirror and a complete behind-the-scenes at The Royal Mint from the Daily Mail – amongst many, many others. Then we awoke on News Year’s Day to national print coverage across The Times, Daily Star, Daily Mirror, Daily Express, Daily Telegraph, The Sun, and The Scotsman. Not a bad way to start 2015 really, is it? 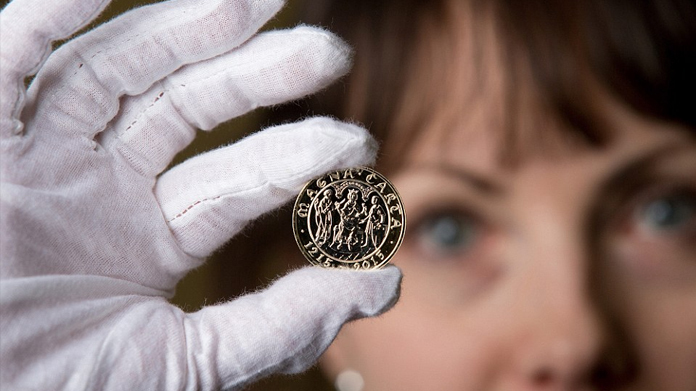 And just in case you’re interested, there will be some stunning new coins coming out later this year including £2 coins marking the 800th anniversary of the signing of the Magna Carta, the Royal Navy’s role in the First World War and a 50 pence piece marking the 75th anniversary of the Battle of Britain.